A single woman on the mission field – today there’s nothing unusual about that. But in the 19th century the openings for single women were few and far between. Those women who were overseas in mission were typically the wives or daughters of missionary men, and usually took the role of Sunday school teacher or met with the wives of local Christians. However, some of these missionary wives in India started to realise an aspect of mission which the men could not undertake. It involved the Indian women, who were veiled in public and segregated within their homes. 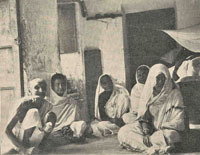 Hindu women, particularly from the wealthier classes, were secluded in zenanas – private apartments for female family members. No men apart from those in the family were allowed in, and no female family member beyond the age of childhood was allowed out unguarded. With very little contact with the outside world, these women were denied any education or training in crafts, and were left to care for the family. In 1854, Mrs Elizabeth Sale was granted access to a zenana in Jessore and began meeting with the women and teaching them needlework and other crafts. I entered a large room where there were several women. They all seemed startled and retired to the further end of the room. I said, “I am your neighbour and am come to see you.” They had never seen a white face before. They began to talk to each other, saying “How does she know our language? Where has she come from? Has she a husband? Has she any children?” I answered all these questions and told them I would bring my children to see them. After a while I asked them if they would like to learn to read. The Babu, standing outside the door, said “No, they have no intellect; they could not learn. Woman is only a beast.” “Oh no, Babu” I said, “the same God who made me made them. Will you let them try to learn?” “Who will teach them?” “I will” I said. After some time this work began to grow, with more women visiting zenanas. It was ‘an achievement impossible to a man’. Openings in conversations to share their faith were rare, especially in the early days, but they continued visiting the zenanas, and gradually they were able to talk more freely about Christ. It was slow work, but the conversations and friendships were very encouraging. These secluded women were being reached by women who themselves had experienced restrictions. 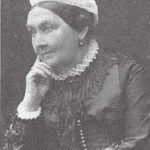 In 1866, Marianne Lewis, a friend of Elizabeth’s from Kolkata, publicised their zenana work while she was on furlough in the UK. As a result, in 1867 an association was formed to support this work. 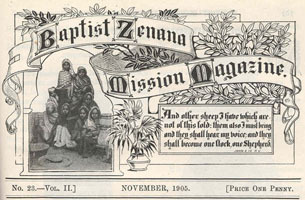 It was called the ‘Ladies Association for the Support of Zenana Work and Bible women in India, in Connection with the Baptist Missionary Society’, and was later known more simply as the Baptist Zenana Mission (BZM). The missionary women saw the education of high caste women and girls in zenanas as fertile ground for evangelism. The education of the zenana women was always viewed as important, especially so they could read the scriptures for themselves. The missionaries began by teaching the women to read, but soon recognised the great advantage if education could begin in childhood. Thus started the work of zenana schools; providing schooling for girls, including the principles of the Christian faith. The BZM also sent out women to China, Congo and Ceylon (now Sri Lanka). 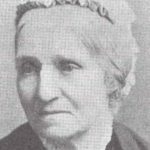 The BZM pioneered Baptist missionary work by women among women and opened up the way to freedom for many. But in the early part of the twentieth century, as more single women were going out as missionaries, the BZM looked to amalgamate with the larger organisation of BMS. Despite their reservations, the BZM Committee members handed over control to the male-led BMS, and a half-way agreement was reached in 1914 to create the Women’s Missionary Association, a department within BMS but with a separate committee, treasurer and finances. In 1926, the merge was finalised, and BMS also saw the election of the first female chairman of the Society, Lady Pearce Gould.